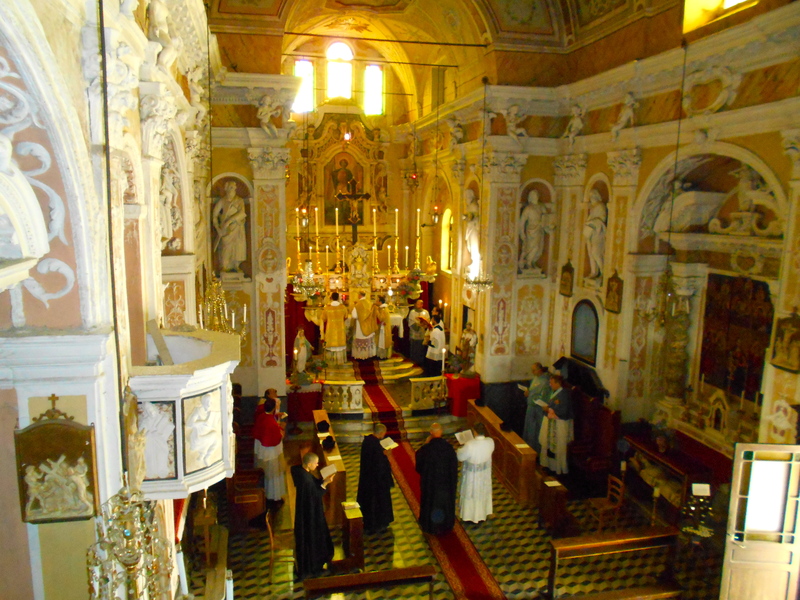 A new community of strict observance in the Benedictine tradition was born on July 2nd 2008 in Villatalla, a small Italian village located in Liguria on the heights of Imperia, very near to Ventimiglia and the French border. (see map). 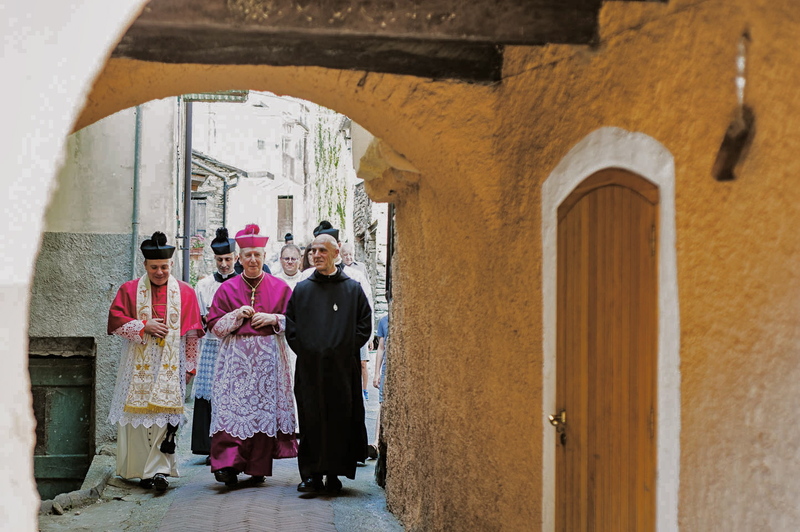 This community was founded by two monks originally from the abbey of Le Barroux (France), at the request made to them by His Excellency Mario Oliveri, bishop of Albenga-Imperia. 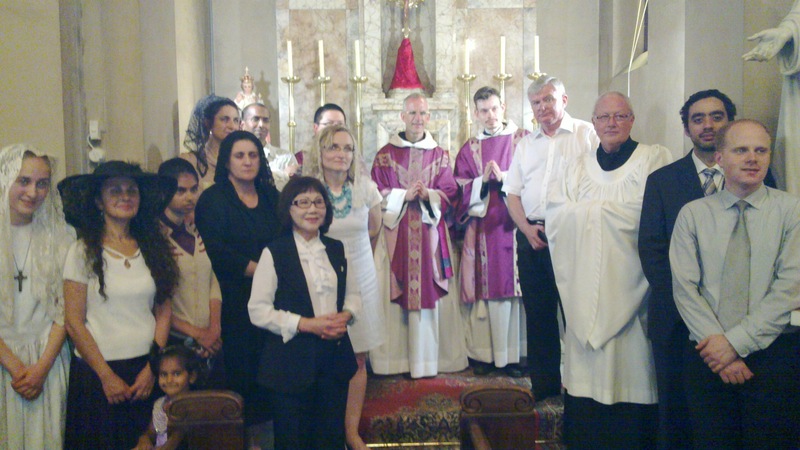 Here you will find information on this monastic project and some of the events which marked their recent installation. This information is above all an appeal to the charity of your prayer and, for those who can, a request for material help. Heartfelt thanks. 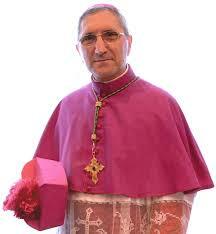 Dear Friends, a year ago our new bishop Mgr Guiglielmo Borghetti canonically erected our community. This year, on the same feast day of St Benedict, he chose to ordain our brothers Antoine and Marie, the former to receive the sub diaconate and the latter the ecclesiastical tonsure and the minor orders of porter and lector. 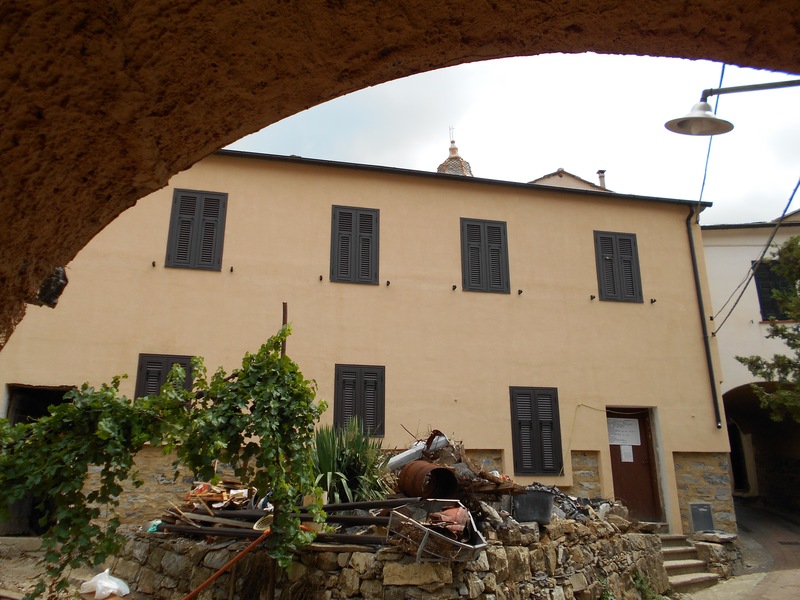 The ceremony took place in the more spacious church of a neighbouring village, Dolcedo, which the parish priest, a friend of the monastery, had placed at our disposal. 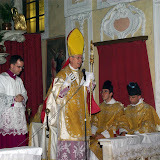 It was Mgr Mario Oliveri, who, at the request of Mgr Borghetti solemnly presided at these ordinations, the latter having given us the grace of his presence. 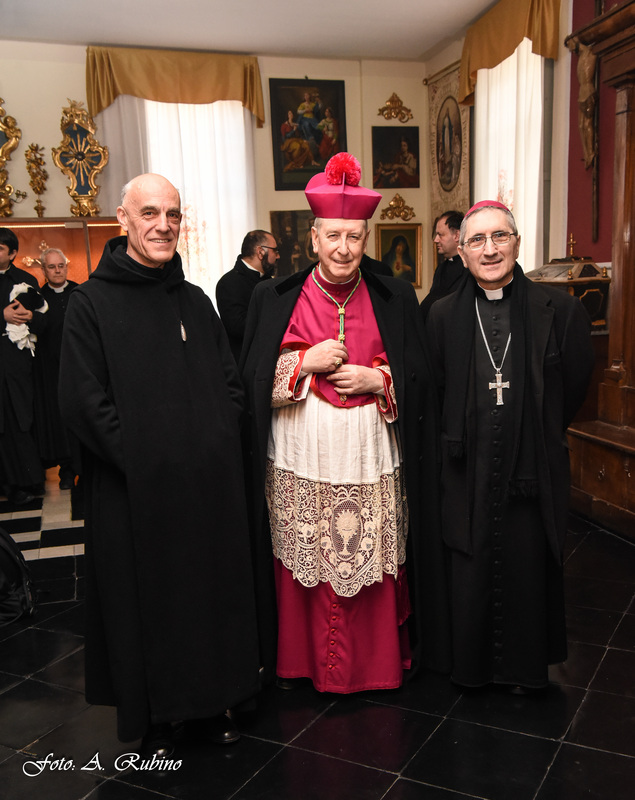 Some thirty priests of the diocese and other surrounding dioceses came to join the ceremony as well as the mayors of Villatalla and Dolcedo together with the marshal of the gendarmerie. “Let us pray to Jesus Christ for his servant, eager for His love, to shed his hair, to give him His Holy Spirit, to make him always keep the clerical habit and defend his heart from the confusion of the times and from worldly desires; so that with this external change His divine hand gives him an increase of virtue, keep his eyes from all blindness of the spirit and the flesh and grant him the light of eternal grace “. The subdiaconate, the first of the holy Orders, marks a major step towards the priesthood. The subdeacon can no longer break his commitment. He is admitted forever to the service of God. With His help, he will have to maintain chastity and remain irrevocably committed to the service of the Church. 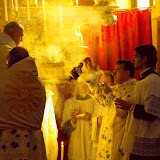 His function is to prepare the water for the Holy Sacrifice, to assist the deacon, to wash the palls and the corporals and to present the chalice and paten to the deacon for the Mass. All these details of the traditional ritual concerning the service of the altar show the greatness, the sanctity of Catholic worship, which even the Holy Angels attend, and the need for a special grace to perform the sacred functions with dignity and sanctity. 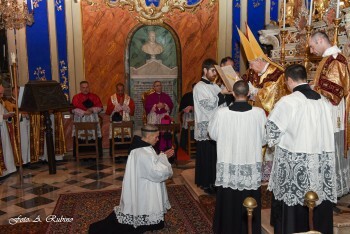 In a moment of prayer, the bishop will ask the “Holy Lord, Almighty Father and Eternal God, to place the subdeacon in his august sanctuary as the zealous and vigilant guardian of the heavenly militia and to serve faithfully at His holy altars”. 21st March: Canonical erection of the monastery of Villatalla. 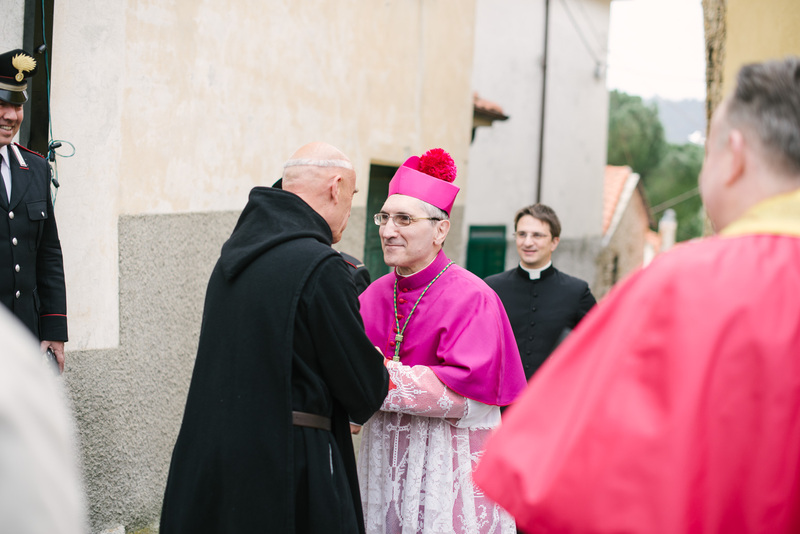 Welcoming Bishop Borghetti in the village square. 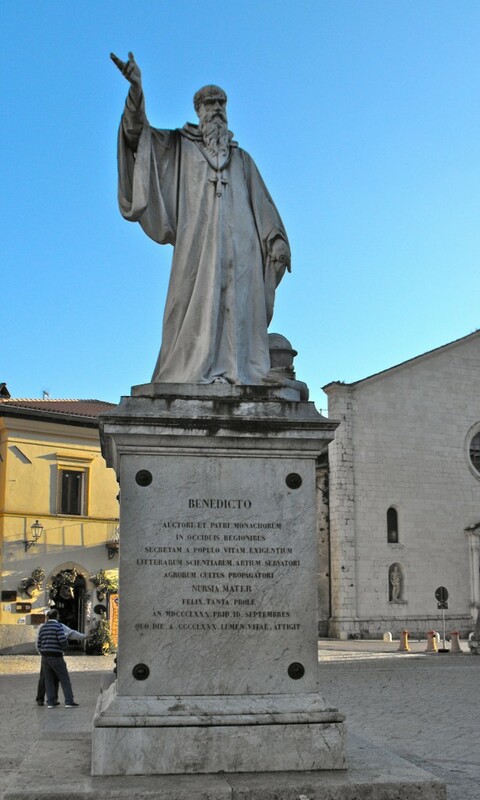 This 21st March, feast of the passing of our blessed Father Saint Benedict: day of grace and jubilation in Villatalla. 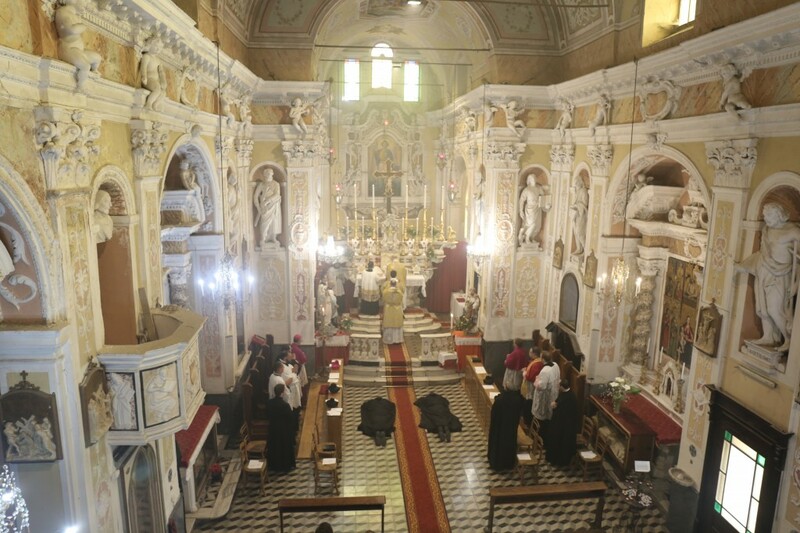 In a packed church, Bishop Guglielmo Broghetti has just erected our monastery as an Institute of Consecrated Life of diocesan right during the solemn Mass celebrated in the traditional rite by the former vicar general of Bishop Oliveri, Mgr Giorgio Brancaleoni. At the church entrance: blessing of the faithful and the clergy. Present were fifteen or so priests of the diocese and several from neighbouring dioceses, friends of the community. The mayor with his tricolor sash and the sergeant of police accompanied by his deputy represented the official authorities of the country. 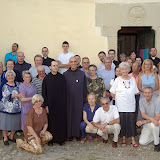 Our neighbours and numerous of the faithful, friends and oblates came to assist and unite themselves in their hearts and by prayer to the grace of this such lovely and moving ceremony, in the course of which Father Jehan and Brother Antoine renewed their solemn monastic vows, while Brother Marie promised obedience, conversion of ways (chastity and poverty) and stability for three years. The origin of the term “monk” signifies the one who is “alone”. Thus we legitimately ask: why would the Catholic Church support the choice of one such who wishes to “remain alone”? Would it not be more useful to direct vocations towards a life more like that in the parishes, especially today when the priests are ever less numerous? 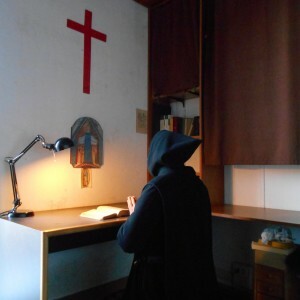 In fact, to really weigh up the monastic life, it has a particular importance in the life of the Church, as it has always underlined the Petrine ministry. Man has by nature a religious dimension which we cannot suppress and which directs his heart to the search for the Absolute, of God who fills more or less clearly or unintelligibly this insatiable need. When in the course of life’s events this need surfaces in the conscience, it makes man a seeker of God. For Saint Benedict that is the fundamental sign and criterion of an authentic monastic vocation. In the Christian environment this search became the “sequela Christi”, which means “the path which leads to God”, in the obedient listening to his Word of grace, of truth and of life. So the monk is not a man alone but a man who through the solitude of his style of life, puts God, Creator of heaven and earth, at the centre of everything, God the author of the grace which gives meaning to the present and future life, to the life which will continue after the crucial passing of death and the decline of the mortal body. Life and death are accepted in the hope of the Kingdom. That is the whole meaning of the famous vision St Benedict had when he contemplated the whole world dazzled by an exceptional ray of light which united him with God: it is in their intimate connection with God that all the realities of the world hereunder are accepted and transfigured. So it is the search for God which defines the monk and constitutes the axis on which rests his life of prayer, of work and of example, for all of us who are in the world but not of the world. 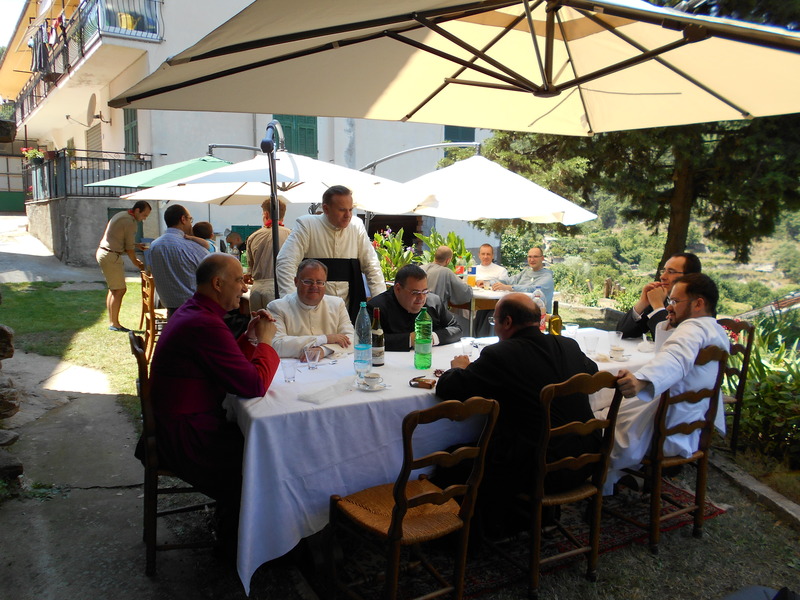 After the solemn, magnificent liturgy of prayer came that of the sacred liturgical ceremony of friendship around an aperitif. These are the joyful feasts, when all those united in the amazing silence of the same sacred communion meet up. 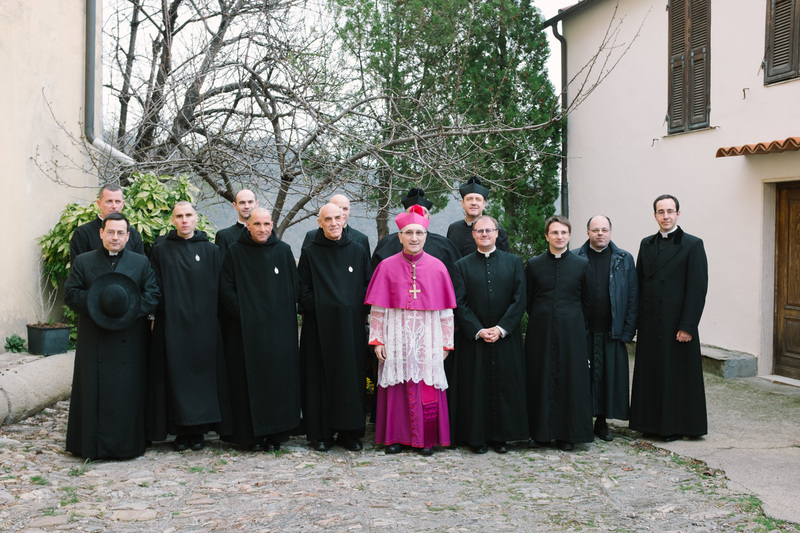 A group of clergy around Bishop Borghetti. 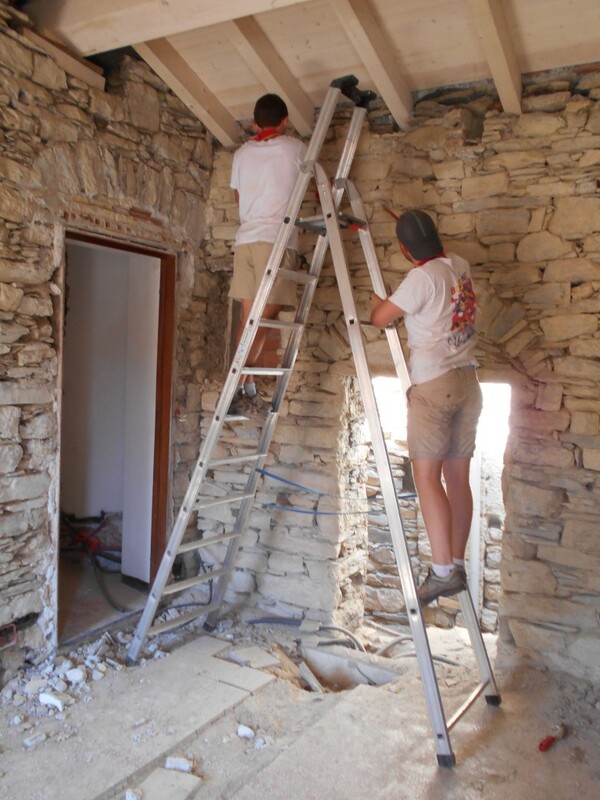 Two years ago, thanks to your help, we were able to rebuild the roof and facade of the house named “St John”, which gave us three additional cells, a separate refectory and kitchen and a chapter room for community meetings. (See the attached transformation). But this is only the outside of the house. 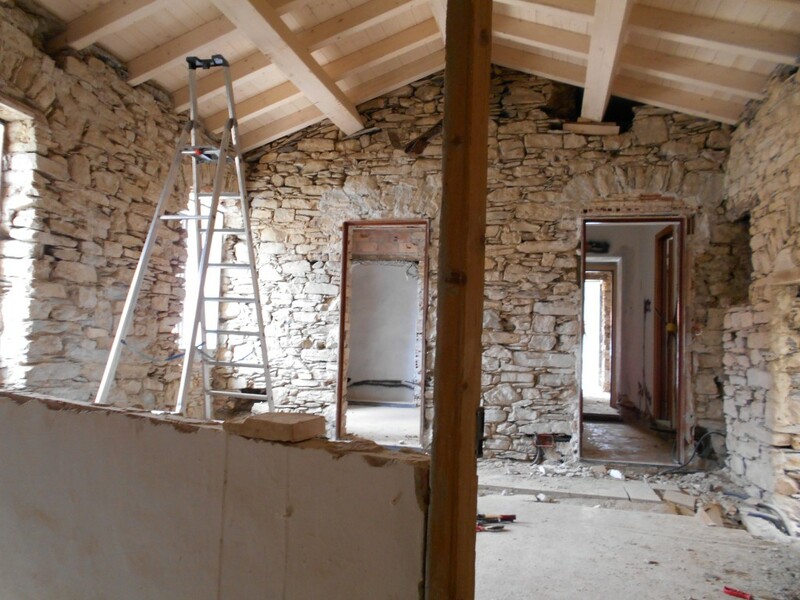 Here we are now about to restore the interior, where everything is to be renovated: plaster, paint, plumbing, electricity, heating, not to mention doors and windows. I am well aware that the financial situation of many of you is difficult and that many communities legitimately appeal to you from all sides for their apostolic works. I take advantage, however, of the grace of Lent and of the Church’s invitation to penance and mercy to draw your attention and heart to our community and its vital needs. The cell is the antechamber of Heaven, the second sanctuary. These sublime words say infinitely more than I can of the importance of the contemplative life, and the vital necessity of sustaining it by temporal aid, without which it can neither develop nor intensify. The monks are in tune with the God to whom they pray and whom they serve, “this God of the Armies who made himself the unarmed God”, who makes the highest of the lowest, the superior of the inferior, for even if the earth does not need the rose, the rose still needs the earth. Prayer is the Work of works. 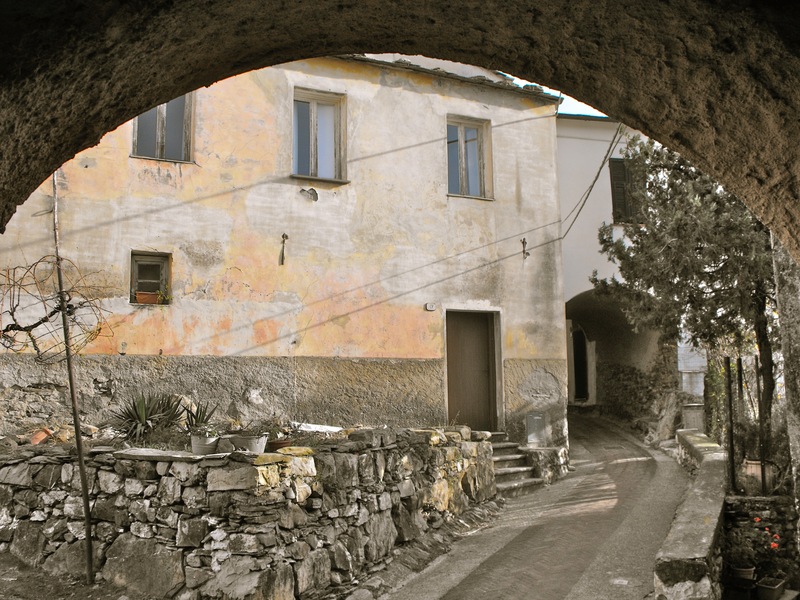 It passes before any apostolate that it supports secretly and effectively. But without your help it cannot grow and flourish under the firmament of this world that it must save from evil and unhappiness. In your letter of February 6, 2008, you paternally welcomed me into your diocese of Albenga-Imperia to found here the monastery of St. Catherine of Siena, where the monastic traditions handed down by our founders and liturgical traditions lived according to the motu proprio Summorum Pontificum of the previous Pope Benedict XVI are kept alive. 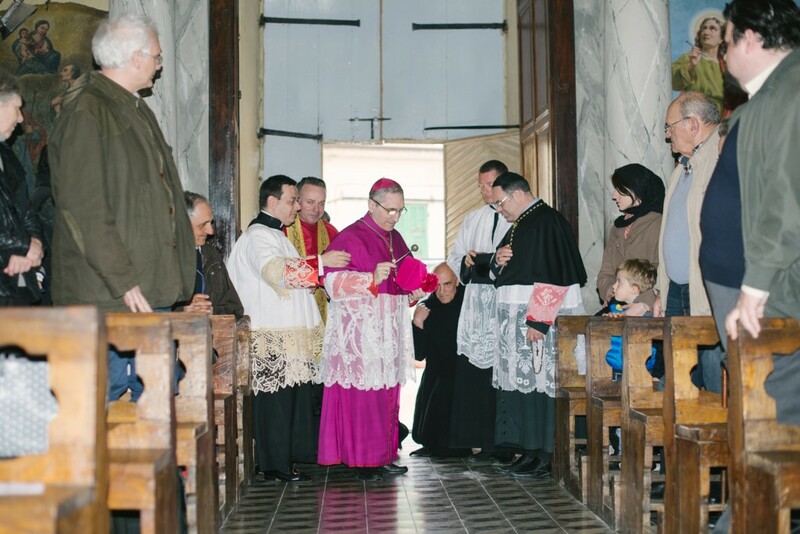 On March 21 2012 you gave us the grace and joy of erecting the monastery as a public clerical society of the faithful ad experimentum for three years. For the last seven years, despite numerous attempted vocations which were not always successful, the community is currently stable with 3 members, the minimum number required by law to form a group of persons (can. 115§ 2). For the last seven years in Villatalla the divine office and the daily sung mass have been offered continuously without interruption and the divine praise continues to be faithfully celebrated faithfully seven times a day and once at night in Gregorian chant, the Catholic Church’s own song, from matins at 3:30 am to Compline at 8:00 pm. With the ad experimentum of the society coming to an end on March 21 2015, Brother Antoine, Brother Marie and I myself come humbly to ask your Excellency for the grace to see our community erected as an institute of consecrated life under diocesan law. 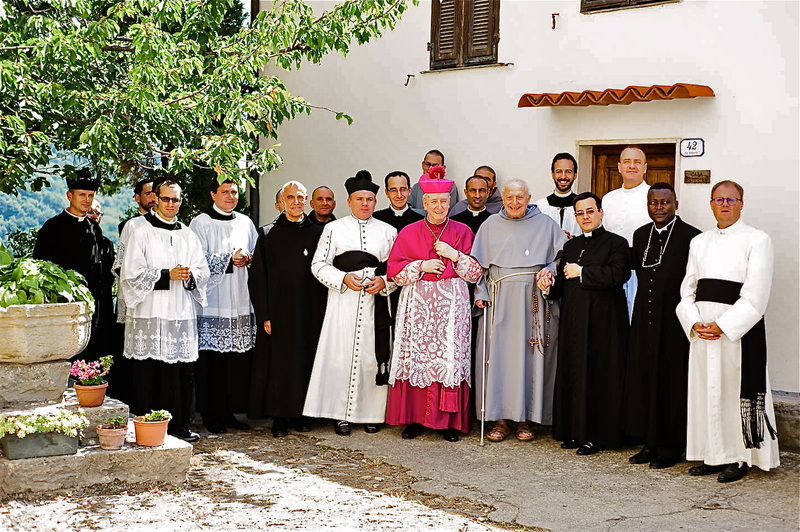 This grace will give our community a stronger and more stable ecclesial recognition and will protect its charism from possible disputes, which are especially to be feared during this period of unrest and uncertainty for the Church. I also think such recognition will attract more vocations who need reassurance about the reliability of our community. The approval of the Constitutions by the Holy See is a condition of validity for the erection of a diocesan institute. Signed on March 25 2015, it arrived too late for Monsignor Oliveri because that same day, at the request of Pope Francis, he renounced the jurisdiction attached to his office of diocesan bishop. Mgr Borghetti had to take the time to get to know his new diocese and to make his first visit to us on 12 March 2016. 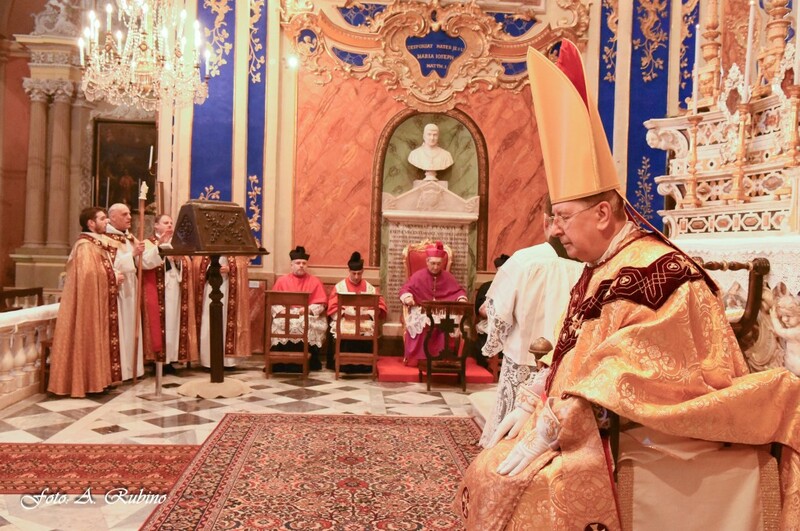 On several occasions and in public He declared that without having a personal feeling of tradition He nevertheless fully respected the motu proprio Summorum Pontificum of Pope Benedict XVI. 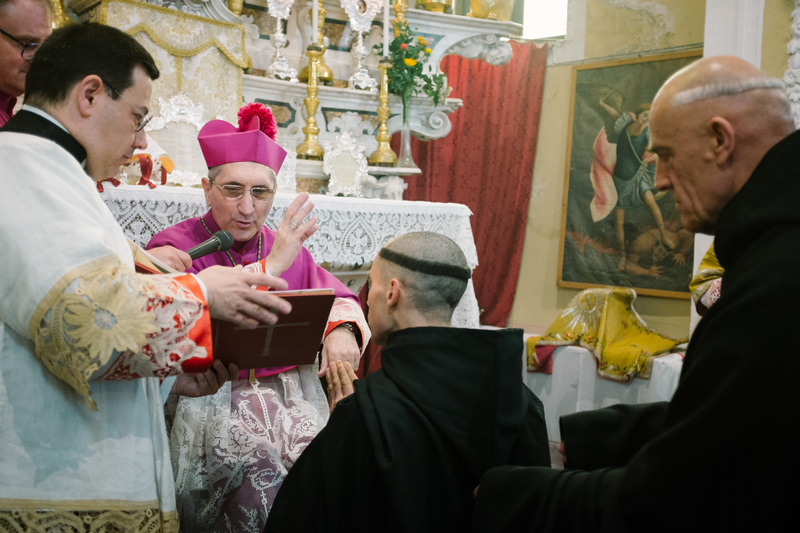 He has kept his word: several masses are currently celebrated according to the traditional rite in the diocese at the request of groups of the faithful and He himself will come and erect us and receive our monastic vows on March 21 next. 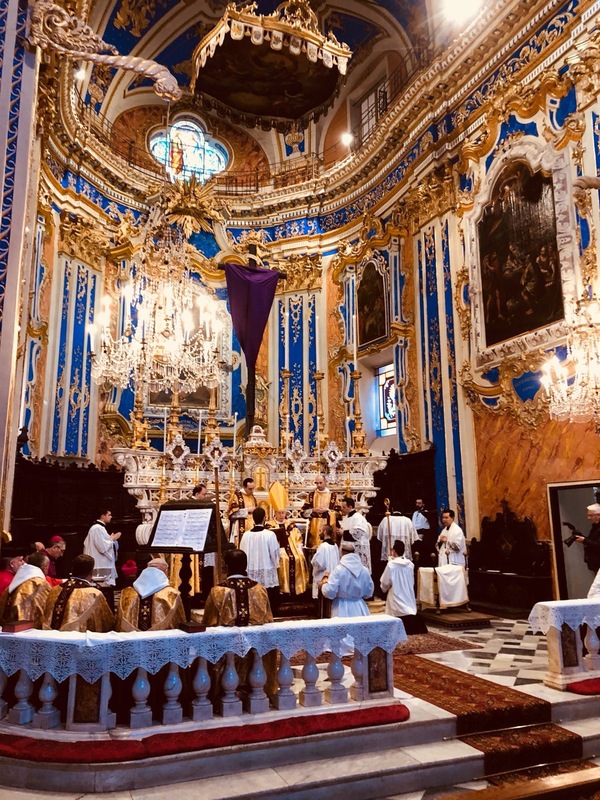 At His request, the traditional Mass will be solemnly celebrated by the former Vicar General of Bishop Oliveri, Bishop Giorgio Brancaleoni at 11am, and He himself will assist in choir. 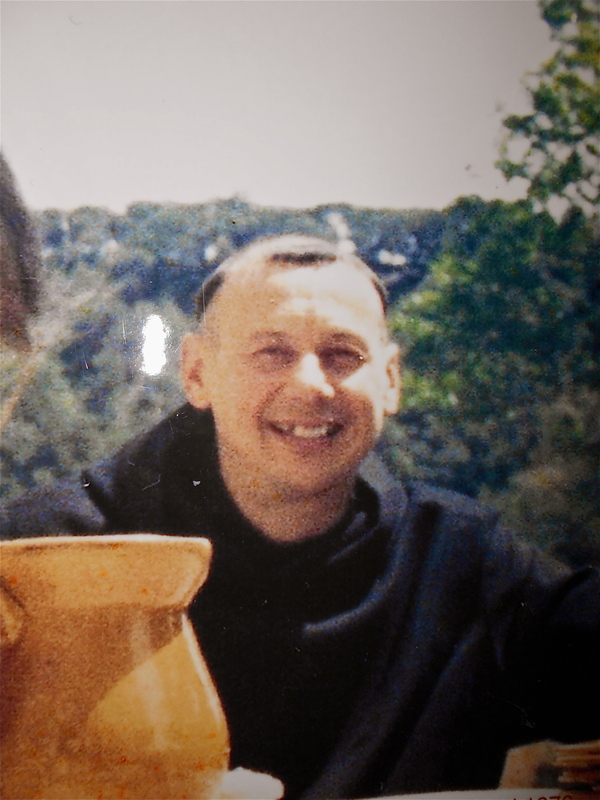 Dear friends, I come to share with you our joy in receiving the approval of the Holy Church to continue our monastic life in full fidelity to the grace transmitted and received at Bedoin in 1970 by Dom Gérard of which I had the honor to be the first disciple. Magnificat! Thank you for accompanying us with your prayers on this blessed day and we ourselves include you in ours every day. May God bless you and your families! During the summer of 2016 in Villatalla we had a visit from Dom Cyprien, a former monk of Le Barroux, originally of American origin, together with two of his brothers, Father André and Brother Jean-Baptiste. 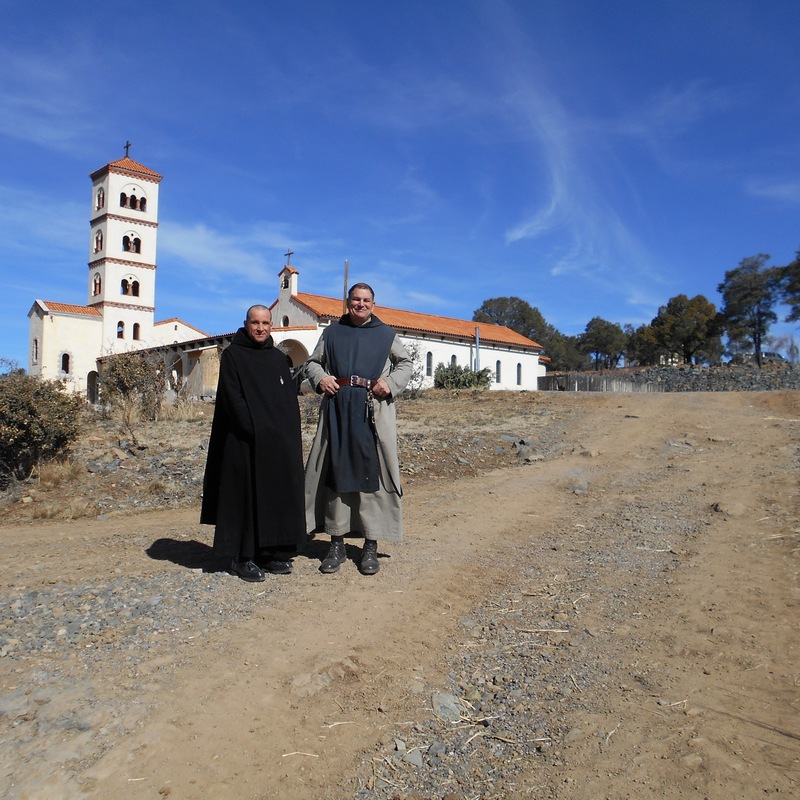 At the beginning of February, Dom Cyprien offered us a trip to his monastery of Our Lady of Guadalupe founded 25 years ago. 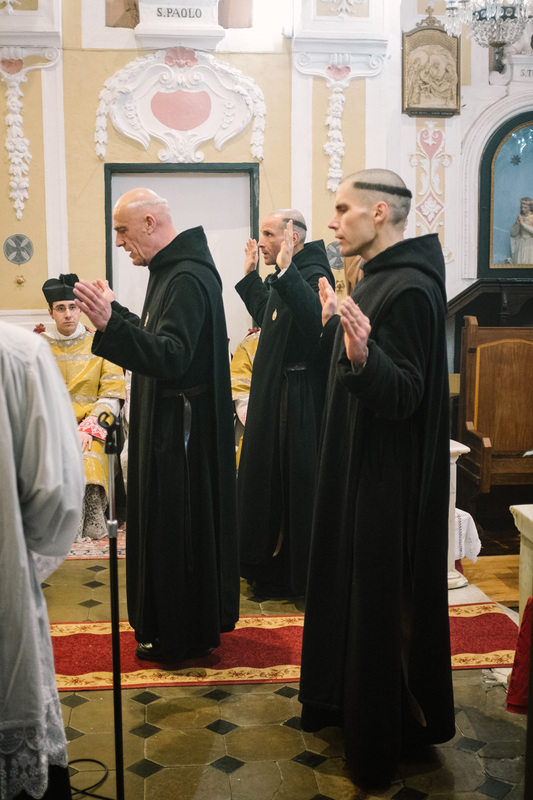 It currently holds 40 monks, average age 25 years, including 5 priests and ten or so professed brothers. The remaining two thirds are lay brothers. We found the spirit of our founders, Father Muard and Dom Romain Banquet very alive in this young establishment and the founding grace of Bedoin from the 1970s and 80s. 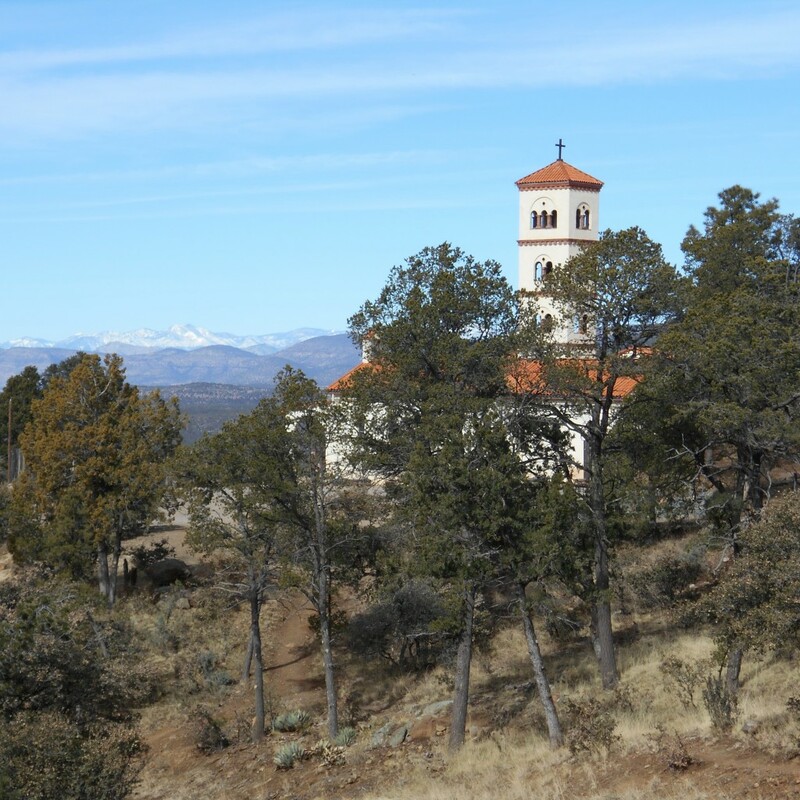 The monastery is located in New Mexico in the town of Silver City, on a high and very isolated mountain plateau 2000 meters above sea level. We were amazed at the monastic solemnity and the spirit of this generous young group, joyful and full of charitable attention in regard to us. The buildings and all the details of the construction and interior fittings have been carried out with a great sense of the beautiful heritage of Dom Gérard. In the corridors and halls one can admire many paintings of French saints: Saint Joan d’Arc, Saint Francis de Sales, Saint Bernadette, not counting those of our founders. The monks work in numerous workshops: forge, woodwork, building, leatherwork, not to mention the breeding of horses, cows, sheep, chickens and rabbits; plus a vegetable garden that contains 3 large greenhouses, and especially a factory of a coffee with unsurpassable taste, in short a small monastic hive of activity, all very hard working and disciplined, with the worship of the traditional holy liturgy and the recitation of the rosary in community at the center of everything. The schedule is about the same as at Le Barroux: arise at 3:15 am and retire to bed at 8:00 pm, except for Father Prior who works late after Compline. The community has already outgrown its existing buildings and the brothers live two to a cell. 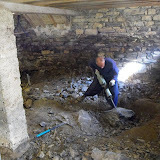 The monks are preparing to commence building a large church in the spring. Help them. Thank you! 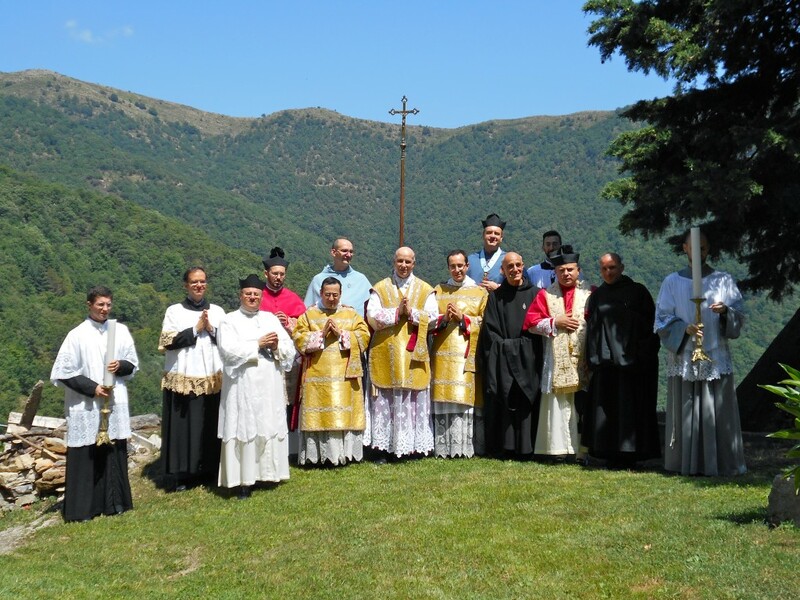 The 11th of July just past, on the feast of St Benedict, Mgr Mario OLIVERI came to celebrate a pontifical Mass in the presence of some 15 priest friends of the diocese together with our neighbours in Villatalla and numerous of the faithful. His Grace gave an excellent homily on the patriarch of monastics, patron of Europe “filled with the spirit of all the just” and a man of prayer, he who in his Rule names it (prayer) “the Work of God to which nothing must be preferred”. “Holy Lord, almighty Father, eternal God, you have established as head and master of an innumerable number of sons of St Benedict your confessor in the rewarding of a celestial wisdom. You have filled him with the spirit of all the just, and after having been pleased with him, you have illuminated him in the radiance of your light, such that in this light of an interior vision his soul was freed from any obstacle and could understand how the things down here are constrained. For all that we give you thanks through Jesus Christ Our Lord”. 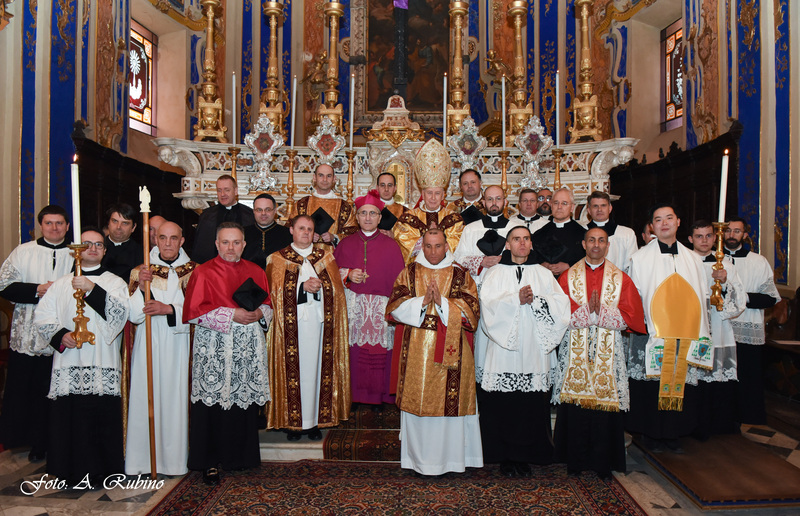 Mgr Oliveri, surrounded Father Stefano Manelli, the priest of Villatalla, and many priests of the diocese. After Holy Mass came the customary photo and the human festivities which all go together, the joy of meeting up and the gift of friendship around a buffet prepared by our secular oblate, brother Ange-Joseph, a man reserved, generous and a fine cook. Before departure: goodbye dear lord, may the Lord bless you and reward you for always being faithful pastor to your currency in the faith transmitted and communicated to the souls peace “Fides et Pax”. We know that for a year and a half Mgr Oliveri no longer has had juridical power in the diocese in which he works, despite still having the titular seat. We wished this day to be a tribute of affection and filial gratitude for all the good which he has poured out during twenty six years of episcopal ministry. He has shown a great supernatural serenity which typifies his episcopal motto “Fides et Pax” (Faith and Peace). It is a steadfast faith in which dwells the secret of peace and goodness which all those who draw near to it feel deeply. Every year on the 15th of August, feast of the Assumption of the most Blessed Virgin Mary and Marian peak of the liturgical year, the Benedictine of the Immaculate monks solemnly renew their consecration to Mary. The Prologue of our Constitutions, approved by the Holy See on 25th of March last, specifies that the Benedictines of Villatalla, wishing to connect with the irreplaceable monastic and liturgical heritage received from their Fathers, a complete consecration to the Immaculate Heart of Mary, “because the virtues which must constitute the essence of our society”, (said Fr. Muard), “are the virtues par excellence of the Sacred Heart of Jesus and that of his Holy Mother”. In the direct line of this heritage, on 22nd of August 1986, Dom Gérard solemnly and irrevocably renewed the consecration of the community and all its members to the Immaculate Heart of Mary, considered as the perfect ideal to imitate. 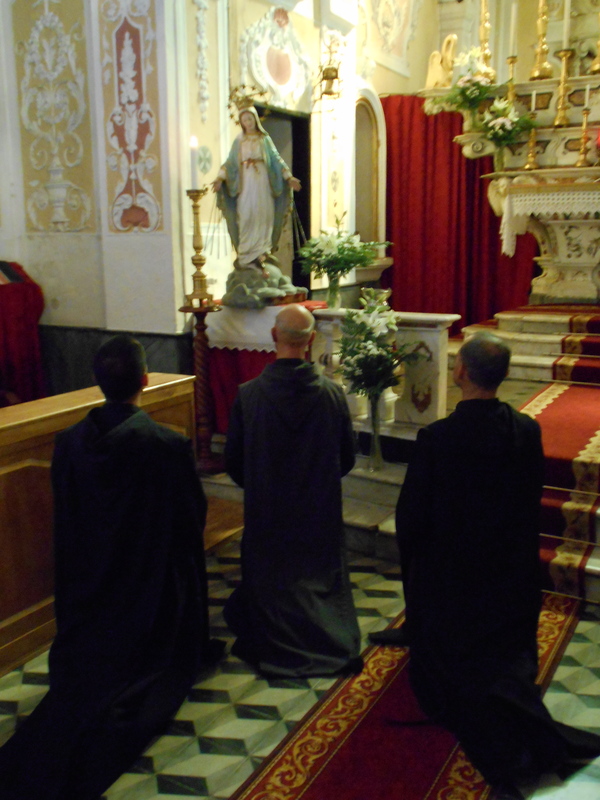 In order to make this Marian consecration more manifest and effective, through which they become the “absolute property” of Mary, the monks of Villatalla wish to adopt the name of “Benedictines of the Immaculate” and see to it that their prayer life, their reading and their manual labour be imbued with Her spirit, to the point where She alone lives again in them. That is why every day in private the Benedictine monks of the Immaculate renew their consecration and every 15th of August, the Fr. Prior solemnly reads the consecration again, with the community kneeling at the feet of the Virgin of the miraculous medal. “O Mary, our sovereign and tender mother, whose most tender heart, wounded by love, burns with a most ardent charity for each one of us, cast your gaze on your children gathered together on this day by a sentiment of profound gratitude for so many graces received, as well as by their unbreakable confidence in the sweet and powerful protection which they dare to expect from you in their weakness, surrounded by great perils. ”Look upon our young community of brethren whose filial confidence lays claim to your help; see what great perils we are threatened with by the state of the world and of Holy Church, and never allow our interior life, supernatural spirit, orthodox faith, love of doctrine, taste for solitude, humility of heart and fraternal charity to weaken. Bring it about that our community and those which it shall found may always be faithful to the spirit of our Father Muard*, your ardent servant, who set forth to all the members of his religious family “the virtues of the Heart of Jesus and the Heart of Mary” as an immense reservoir of grace and love from which we can draw strength to embrace “a life humble, poor and mortified” until the end of our days. “Never allow our inexperience to frighten us or make us pull back. Give us a heart both gentle and strong, so that no success can make us proud, no setback break our spirit. Bring it about that, being nothing through ourselves, we can find our entire glory in our dependence on you, similar to the children your Son set forth as the example for his disciples: children who see in every event the hand of their heavenly Father, who are shocked by nothing and who marvel at everything. “We take as our own, and for all time, the desire of our founders who regarded your Immaculate Heart to be our model “for it is the finished archetype of two characteristics of the Work: interior life and immolation”. “Therefore we beseech you to keep us free of the evil of pride, the thirst for power, the attraction to the pleasures and grandeur of this world. “May the demon never sow among us the weeds of discord, or of jealousy, but may there reign always in the ranks of our monastic family a supernatural peace, the spirit of sacrifice, humility of heart and pardon for offenses. “Bring it about, O sweet Virgin Mary, that the poor are always welcomed among us with tenderness as the envoys of God, but may the spirit of the world, and the assaults of schism and heresy be smashed against our walls and unable ever to penetrate among us. “To this end we ask of you the grace to always keep firm without fail behind the twofold rampart of the holy Rule and the sacred Liturgy, the best guarantees of the purest Catholic faith and the highest sanctity. “O most sweet and strong Virgin Mary, our most loving mother, persuaded of our incapacity to accomplish a plan so far beyond our strength, we consecrate to you today, solemnly and irrevocably to your Immaculate Heart: our community, our works and our foundations, our families, our oblates, friends and benefactors; to you we give everything. Everything is yours, all is for you in our thoughts, affections, desires and projects. “Bound by such a solemn pact, O Mary, we wish to remain immersed in your most pure Heart, which is an ocean of interior life and charity, confident of receiving from you all necessary lights and graces in order to love you and make you loved, so that the life of your Son may be manifested in us for the glory of the Father in the unity of the Holy Ghost. 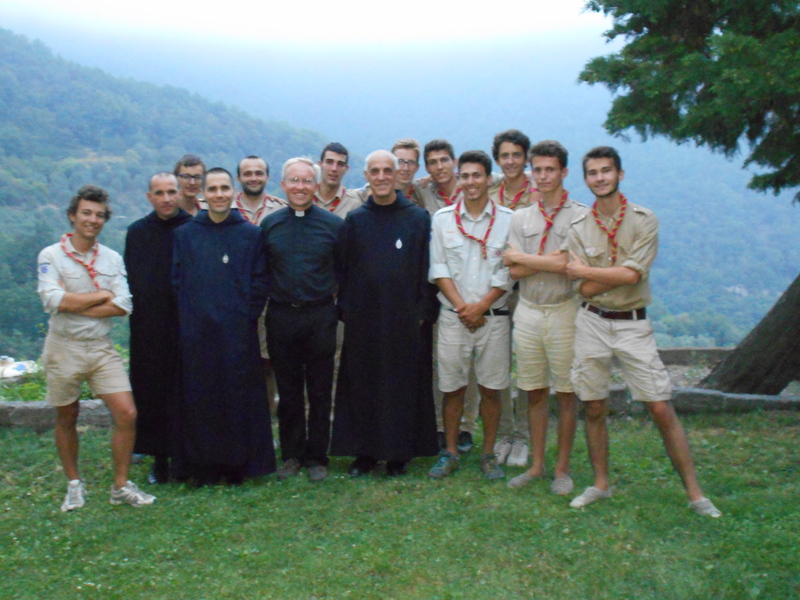 During the month of July some road groups of the Unitarian Scouts of France (SUF) came to camp in Villatalla. The goal of scouting is, in the context of a team life, to learn to become men and Christians greatly more virtuous than the world in which they live, which is decadent, aggressive and contrary to God’s law. At the sanctuary of Our Lady of the Snows above the village. The presence of the scouts in the scorching July heat wave brought a refreshing youthful breeze to the village, as well as righteousness and Christian joy. May God bless them and may Our Lady of the Snows, patroness of the sanctuary at whose feet they pitched their tents, keep them faithful to their scouting promise! July 11, a day of jubilation at the monastery. Every year we celebrate on this day the solemnity of St. Benedict. The church is full for the celebration of Holy Mass according to the traditional rite celebrated by the vicar general, Monsignor Giorgio Brancaleoni, flanked by the deacon, sub-deacon and others officiating. Among the faithful are those who, of all people, are our neighbors and friends. Also this year we have present the roving members of the Scouts Unitaires of France (SUF) not counting the dozen priests of the diocese coming to share this celebration. 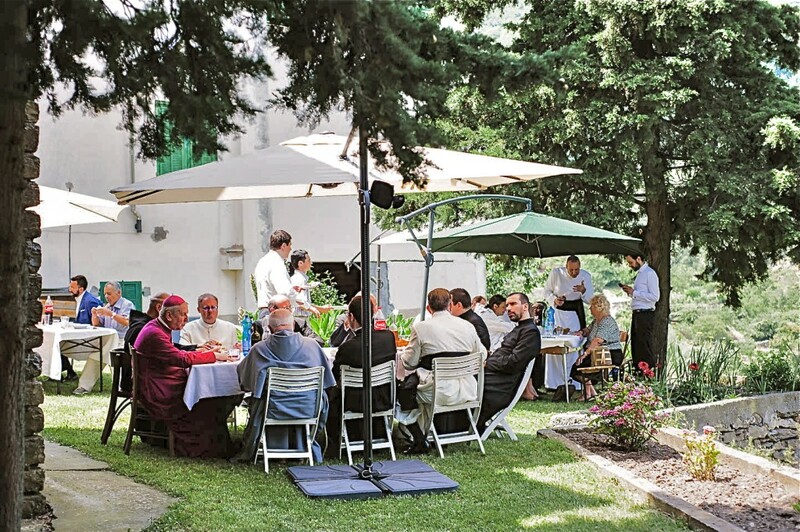 After the ceremony, our secular oblate Brother Angel Joseph, assisted by some pious ladies of the parish, served us a country feast in the meadow in the shadow of the church. The Father Prior thanked all those in Heaven and on earth who contributed to the success of this beautiful day held under the auspices of Saint Benedict and recommended everyone to offer a prayer that the Lord sends us holy vocations. “1500 years ago there rose over the tragic horizon of the great invasions, the radiant figure of St. Benedict, patriarch of Western monks. His life full of miracles threw out a challenge to a world which looked somewhat like our own in its cruelty, prey to unrest and chaos. He made present around him kindness, gentleness, and filial piety. His followers covered Europe with monasteries, teaching people the art of praying and working for God in the hope of Heaven. That protection of our great patriarch, dear friends and benefactors, extends like a cloak of peace upon you, your families and your homes. 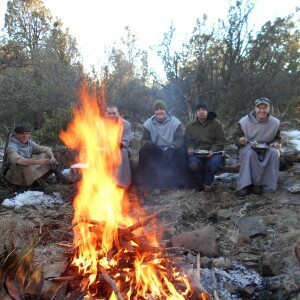 Since the founding of the monastery on July 2 2008, several of our friends and faithful have shown their desire to be able to be connected with our monastic community through oblation. A very fervent group of around a dozen oblates has thus formed in Sydney Australia under Father D. Wong of the Fraternal Society of St Peter (FSSP), to whom we have given delegation for such purpose. 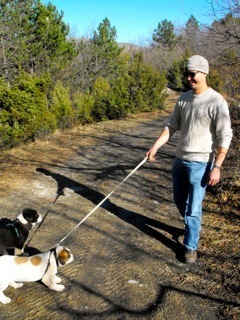 Our secular Oblate, Brother Angel-Joseph and its dog Pepa. 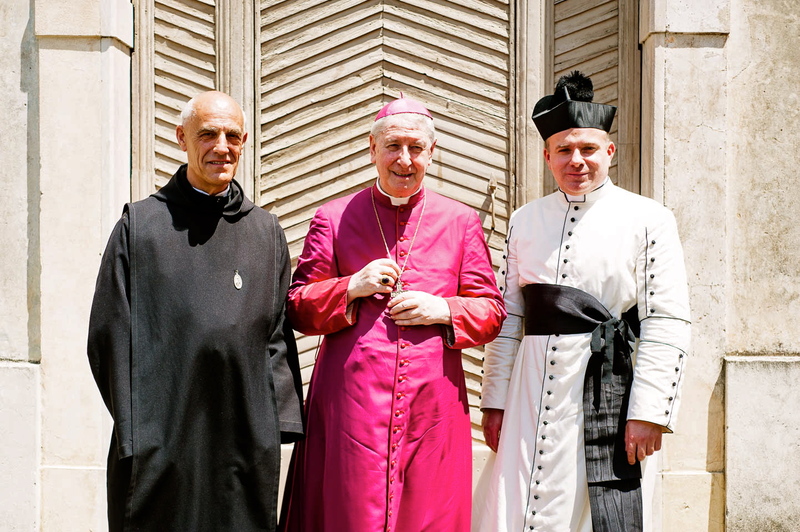 Of course we have Italian and French oblates who are spiritually connected to our family of Benedictines of the Immaculate. Quite close to us another oblate who comes from Central America, brother Angel Joseph, has wished to live his oblature in an even more intense manner. 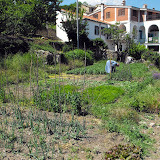 He lives alone in a small village house together with his dog Pepa and three canaries which amuse all those in the single street in his village. He is united to the liturgical prayer of the monks and gives a large part of his time to the service of the community as cook, garment maker and master of the hen house. 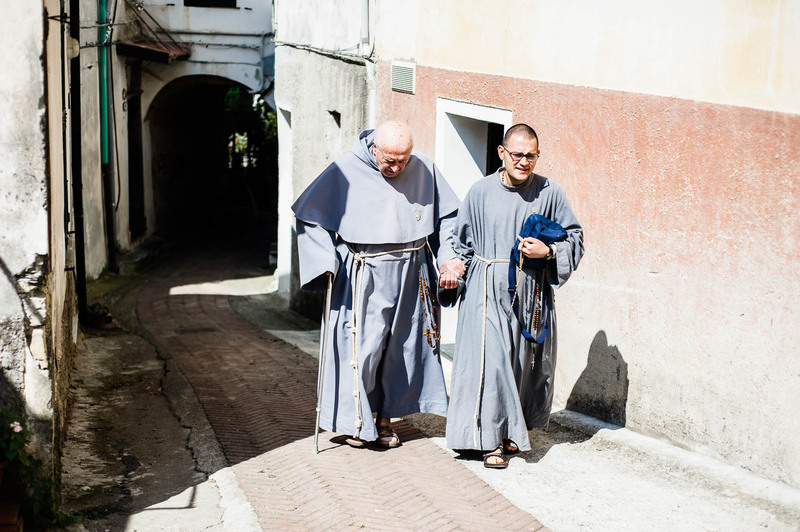 One can admire and even venerate the Benedictine monastic ideal, but what can it bring to the simple Christians already consecrated to God by their baptism and calls to sanctity? Well, the Rule of St Benedict itself teaches us: it is in effect itself a school in which one learns to serve Our Lord, scola servitii Domini. “Oblation, (wrote the very reverend Father Dom Gerard), is above all things, a spirit. It is the spirit of St Benedict. 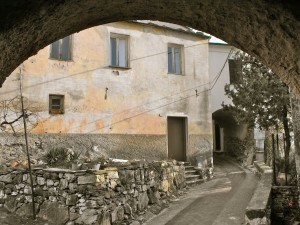 A spirit so simple, so powerfully rooted in the first ages of Christianity that it can readily spread from the trunk of the tree to even its longest branches… The Benedictine spirit raises the monk to seek God in a persistent and concrete fashion, to organize his whole life according to God’s will, under the eye of God, for the service of God”. It is also in this same spirit that the Rule guides and sustains our oblates to organize their whole life in praise to the glory of God and for the salvation and sanctification of their soul. Les Bénédictins de l'Immaculée sont érigés canoniquement - Riposte-catholique on 21st March: Canonical erection of the monastery of Villatalla.